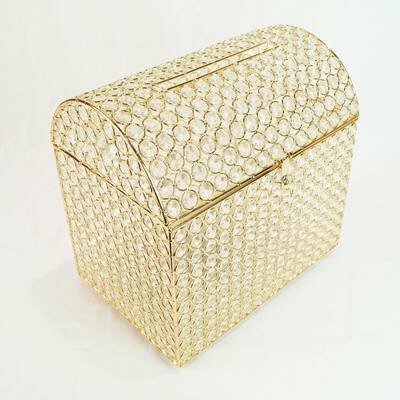 This small box is enchanted with crystals and outlined with "gold". It has a slot on the top for inserts and is perfect for storing gifts such as money, cards, and giftcards. It can be kept sealed with a small gold pin, which is included with the rental, that can be easily removed for the guest(s) of honor to retrieve their gifts after the event. Also available in silver.